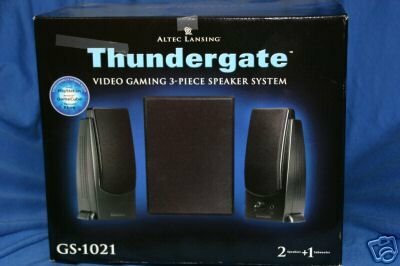 The Altec Lansing Thundergate 3-Speaker system is a multi-use system and can be used with Video Gaming systems, MP3 Players, CD Players, DVD Players, or PC's and Laptops. Altec Lansing powered speakers feature built-in amplifiers, so you can transform just about any audio source into a powerful sould system. This package contains two powered satellite speakers, one powered subwoofer, Color-coded cables and RCA adapter cable, Users manual and quick connect card. Shielded Speakers and Subwoofer will not cause interference with other electronic products. Subwoofer adds bass for a new level of gaming excitement. Satellite Speakers - Two sepaable speakers improve sound separation. Headphone Jack included for your private gaming enjoyment. Built-in Control - Power On/Off, Master and Subwoofer Volume are all at your fingertips. Easy Installation - Get up and running in seconds with color coded cables.